As much as I enjoy creating main dishes with our great Alaska seafood, it's fun to focus a bit on the sides. This recipe for paprika oven fries, inspired by the beloved British chef Yotam Ottolenghi, is deceptive in its simplicity, as it offers an explosion of texture and flavor. There's something satisfying in taking a humble spud — bathing it in some duck fat or extra virgin olive oil and a few spices — and transforming it into something sumptuous. As to the paprika, a friend returned from a recent trip to Hungary with one of my favorite souvenirs — local spices. I did a little thank-you dance as he handed me three red paper bags filled with pungent blends of dried sweet bell pepper, including smoked, hot and very hot. I admit that I keep some of my lesser-used spices for a bit too long and they become bitter or rancid. Because paprika takes a starring role in this recipe, I encourage you to seek out a fresh batch (Hungarian or Spanish) from your local supermarket or spice store. In the original recipe, Ottolenghi calls for parboiling the potatoes, which I did the first time I made these. 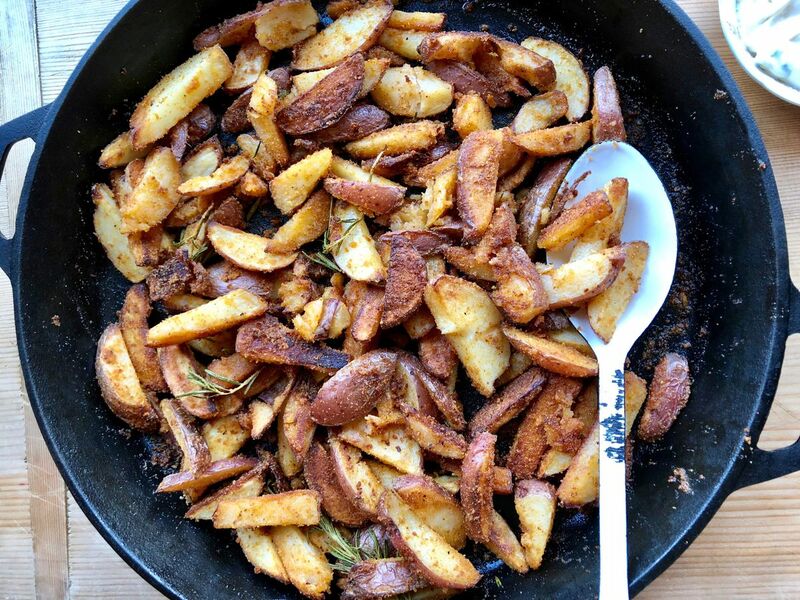 But often, to save time, I just toss the raw cut potatoes together with all the spices and roast them in a giant cast-iron skillet; make sure your pan is wide enough or spread the potatoes out over two rimmed baking sheets. You want them to crisp up and not steam, so give them some space to breathe. The result (even sans parboiling) is a soft, creamy "fry" with crisp, lacy edges. You might be tempted to skip the semolina flour, ground durum wheat, but the addition of it in the spice mix creates just the right amount of craggy bits that offer a fine, almost batter-like texture. If you're worried about buying a bag of the flour and only using a bit of it, semolina is also great for making homemade pasta, pizza dough and even desserts. These potatoes could stand on their own merit, but they also complement grilled meats, fish, and other vegetables. As to the dipping sauce, sometimes I can't help myself and need to gild the lily, so here's an extra recipe for garlic-laden mayo that I like to spike with fresh rosemary and green onion. 1. Preheat oven to 375 degrees. Scrub potatoes well; cut into wedges or sticks and toss in a large bowl with both types of paprika, semolina flour, garlic, and season generously with salt and a bit of black pepper. If using duck fat, melt it slightly before tossing with the potatoes. Otherwise, add the olive oil and toss just to combine. Spread potatoes out in a large cast-iron skillet or on two rimmed baking sheets (give them plenty of room to crisp up). Roast for about 40 to 50 minutes, turning once halfway through, until soft in the center and golden brown and crisp around the edges. Serve warm with your favorite dipping sauce or with rosemary lemon aïoli. For the rosemary lemon aïoli, combine mayonnaise, garlic, rosemary, green onion, lemon zest, juice, if using, and a pinch of black pepper together in a small bowl; stir to blend. Taste and add more lemon or garlic, if desired. Chill, covered, until ready to use. Store any leftovers in an airtight container in refrigerator for up to three days.